Jakarta, June 2017 – Sharing is a gift. It is a worthwhile gift. If you know the wonderful blessings of sharing, you will not hesitate to share your blessings. The Iftar held on Thursday, 15 June 2017 and attended by children from the orphanage Da’rul Amal – South Jakarta and media colleagues. Special acoustic music performances from ADERA and HIVI!, followed with the Magic Show from Iwan Bagaskoro and team. The shows created a happy atmosphere and put the big smile on the face of children from the orphanage as well as all invitees. The event then continued with Tausiah and Kultum by Ustadz Jaka Tingkir Ta’jil until Iftar’s time. 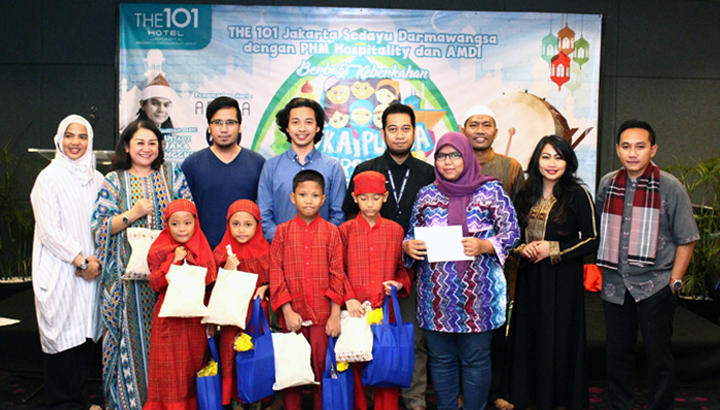 This activity is expected to strengthen the relationship between PHM Hospitality, THE 1O1 Jakarta Sedayu Darmawangsa and AMDI (Association Music Director Indonesia) with all the media colleagues and also the opportunity to share the joy and blessings with the orphanage children.